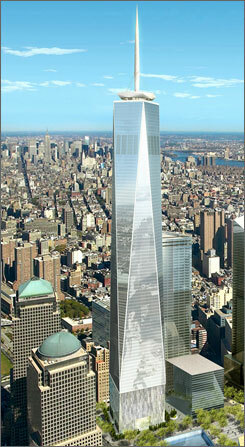 I had a dream 06/14/2014 just before waking where I saw the new Freedom Tower in New York City. On the very top of the tower, I saw a hydra, a multi headed dragon. I know it had at least 3 heads on it. I am praying about the meaning of this as of yet I am not sure. The above is something like what I saw in the dream. Again, I am not sure of its meaning. It is interesting that of all buildings, it is this one that it picks to perch upon. I do remember it having its mouths open and possibly roaring. 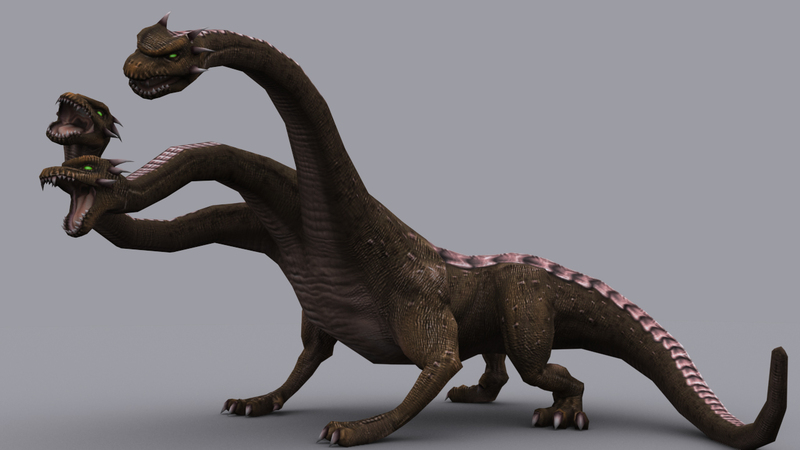 To me, the three-headed hydra is demonic. So this would mean that the Freedom Tower in NYC is of demonic origin. NYC does not have any Godly leadership—like most of the United States. If destruction falls on NYC, it would not surprise me. Back in 2007, I met a Christian in Nebraska; he used to fly to NYC to do street ministry. In 2008, he told me that he wasn’t going back to NYC; he met two prophets in 2007 and they told him that the people in NYC weren’t repenting of their sin and that the Lord told them to leave NYC. In 2011, David Wilkerson died in a car crash; Wilkerson used to have a ministry in NYC. Before the Lord destroyed Sodom and Gomorrah, He sent angels to lead Lot and his family away from God’s wrath. Yesterday, I was walking west on U.S. 20 about five miles west of Kilgore, Nebraska. This pickup and trailer pulled over. I ran up to the vehicle and it was LaVerle! This was the third time in a month that LaVerle has picked me up. LaVerle started laughing and I was laughing. The Lord sure has a sense of humor. So LaVerle and I drove to Rushville, Nebraska, dropped the pickup and trailer at the ranch his uncle managed and then drove his pickup home to Chadron. There are no accidents in the Kingdom of Heaven and I know that LaVerle picking me up three times in the past month meant something. LaVerle has a street ministry in New York City. He works at a uranium mine near Crawford and then flies to New York on his days off and ministers to people on the street. LaVerle has been to New York seven times in the past year. He believes that in the near future he will leave Chadron, Nebraska permanently and live in New York—either in Manhattan or Long Island—and minister to people in the city. Two days ago, I hitchhiked from Helena, Montana to Murdo, South Dakota. Yesterday, I hitchhiked from Murdo to Chadron, Nebraska. It was around O degrees F when I started walking south out of Murdo on U.S. 83. I walked around four miles and then got a ride to Mission, South Dakota. Ice had formed on my eyebrows, so I was very grateful to finally get a ride. After Mission, I walked south a few miles and got a ride in the back of a pickup to Valentine, Nebraska. I checked my e-mail at the public library in Valentine and then started walking west on U.S. 20. I then got a ride to Chadron. On the way east from Montana, I thought, “It would be great if LaVerle saw me walking down the road.” I got dropped off on the west side of Chadron and walked over a half mile heading west when guess who picked me up? LaVerle. The Lord works in strange ways. I told LaVerle that this is the fourth time he has picked me up. He just got back from a mission trip to Peru. He flew back to Houston, then to Denver and drove back to western Nebraska the day before. LaVerle was in Peru for a month. He drove me to a Taco John’s restaurant and bought me something to eat. We talked for quite some time. One of the important things that LaVerle said was that the Lord told him not to go back to New York City. LaVerle has been to New York several times on mission trips. He told me that a number of prophets have pulled out of New York because people aren’t repenting of sin and destruction is coming. I told LaVerle that the Lord had me hitchhike from Ames, Iowa to New York City (actually, I hitchhiked to New Hamburg, New York and took a train the rest of the way into Manhattan) in 1998. I visited David Wilkerson’s church at Times Square. I was in the sanctuary for two hours and I started weeping in the Spirit. I left the church building (formerly the Mark Hellinger Theater) and the Holy Ghost fell powerfully on me. I walked to the Hudson River. I believe the Lord was telling me not to go back to David Wilkerson’s church. That evening I went back to the seven o’clock service and the Lord chastened me for being there. Something must have been out of order; the leadership of that church (not necessarily David Wilkerson) may have been resisting the Holy Ghost. I crawled into a sleeper of a tractor-trailer outside of Chadron and slept there last night. It got down to 20 degrees F, but it felt colder. Are you sure what you saw wasn’t a big monkey. My names not Fey Rey, lol. Thanks Tony, you still have an excellent sense of humor. Tim Shey’s comment assessment could apply to many of our cities both nationally and worldwide. Indeed it was, I’m praying about its meaning. Dragons are almost always associated with evil. I believe the freedom towers, as the book “The Harbinger” states that fits with Isaiah 9:10 – the foundation of this building is built with dressed stone – it is a form of rebellion against what happened on 9/11 – it could be a source of evil. That particular year, 2001 was a year of the Shemitah – a time where they are to leave their fields fallow and a year of credits and debits, but America did not do that – they rebelled and 2 leaders quoted the verse in Isaiah 9:10, unbeknownst to them the true meaning behind that verse – it is not a blessing or proof of standing against their enemies, but rebellion and continuing on their same path – a path of destruction – a path that does not turn them back to God, but away from Him. Read the book by James Cahn – he is a Messianic Jewish pastor in NYC – he is the one who wrote it – it is extremely interesting and I believe right on! I have read it completely now and it is hair raising just how exactly 7 years later in this country after 9/11, 2008 that we had the financial collapse in this country – all of it happened on the same days of Jewish days of meaning. Something will happen in 2015 as well this pastor predicts, seven years after the last warning from God! I have read the book and you are absolutely right. I also believe that we have little time to repent. I have seen other vision and had other dreams of things like this. Thanks for the input on the blog. Your comment was right on the money. I agree, I do not believe we have a lot of time to repent. I believe that God’s return for His church is close at hand!! I try to tell others about the book – I think it is very powerful!! Don’t know if this may be relevant but John Kilpatrick of Brownsville revival is preparing to share what he’s hearing from the Lord on something ‘from left field’ about to blind-swipe national leaders. Have you perchance read a book called, ” the harbinger”? Not yet and have seen refcs to it on US internet but am aware of its scriptural thrust as friends at the house church we visited on holiday spoke highly of it. So we heard and are looking forward to what John K will be saying on Sun as we’re on-line members of that church. I agree… Demonic for sure. Tony et al, re: 2008 and the Harbinger novel. I’ve personal copy of ‘As America Has Done To Israel’ from John McTernan and highly recommend it along with his blog for hard data eg. an overview of his daily coverage from Biblical view is at http://defendproclaimthefaith.org/blog/?s=crash+2008 . Scrolling through his Aug-Nov 2008 archives gives blow-by-blow account of what happened. And Aug-Sept 2001 is interesting too!! For an example of prophecy see words given in UK before Sept’08 at http://richards-watch.org/prophecies-and-visions/library-prophecies-visions-for-uk/sharon-stone-sept08-will-convince-you/ – as well as 1991 word re 9/11 in my blog’s library. I’ve a personal copy of ‘As America Has Done To Israel’ from John McTernan that has all the hard data and is updated on his blog. Eg. you may like to read his intro to the crash athttp://defendproclaimthefaith.org/blog/?s=crash+2008 and his Sep-Nov ’08 archive gives daily blow-by-blow account of events. Also, see prophetic word re Sep’08 given in UK at http://richards-watch.org/prophecies-and-visions/library-prophecies-visions-for-uk/sharon-stone-sept08-will-convince-you/ and you may like 1991 word about 9/11 listed in my blog’s Library under 1991. Pondering this dream in my heart Tony. I can see it in my spirit. It was definitely one of the most disturbing dreams I’ve ever had. I meant, I can see it by and through spiritual eyes…Kimberly Daniels does an excellent job of defining the role of the hydra as a principality of air. I thought you were talking about my post, “forgiveness part IV”. That dream was quite frightening. Sorry for being brain dead. That has to do with money Tony, this dragon. Google ‘opening ceremony gotthard tunnel’ and you’ll see. Absolutely to puke on. We’ve never seen such public mocking of Jesus in history . So brutal, so shameless, so bizar, so evil. Obviously to celebrate or start the ‘birth’ of something. Well Tony this was the post I saw as the new post today. I see now that it is an old one. As if also this vision is very vivid now. Is it coïncidence that this came to me as a new one, or does the ridiculous act of the opening connect with this. In the Valley of Slaughter. Recently a law was passed in the state of New York that makes it legal for a mother to abort her child up to the day of delivery. This is one of the most inhumane, cruel and barbaric laws that I have ever heard of. Nazi Germany killed 6 million Jews in death camps during World War II. The United States has killed over 60 million pre-born babies through abortion since 1973. The United States is worse than Nazi Germany. When Russian and Chinese nuclear warheads rain down on certain cities in the United States, I won’t be shocked. Have you seen a much worse law they tried to pass in Virginia? Do you recall this dream from 2017? I had this dream originally as is stated below in 2013. I had a dream 12/15/2013. In the dream I saw the Statue of Liberty . Normally she is holding a torch representing freedom from oppression. Her torch is held high for all to see and was a welcoming site for immigrants coming to New York. In the dream I had, she was not holding a torch but instead she was holding a cup of red liquid, I am assuming was blood, and the liquid inside the cup was bubbling and looked as if it were boiling. I am feeling that this is the cup of God’s judgement. One thing, however, regarding God’s judgement that we must all remember and that is God’s judgements are redemptive and not punitive. God is not willing that any should perish but that all would come to repentance. Shortly after having the above dream I saw in a vision and possibly a dream the Statue of Liberty once again with a cup in her hand instead of the familiar torch only this time I saw inside the cup and it had dead babies in it and they were floating in the cup like ice cubes in a drink. Then I saw a hand take a hold of the cup and force the Statue of Liberty to drink the contents of the cup. Once she did I saw her stagger as if drunk and fall. I had a dream 08/31/2017 once again regarding the Statue of Liberty where once again I saw her holding a cup full of blood with dead babies bobbing up and down like ice cubes. I again saw a hand move into position under her elbow pushing it upwards towards her mouth so as to force her to drink the contents of the cup. Only this time she did not stagger and fall as in the dream I had in 2013. In this dream I saw her double over and begin to vomit the contents of the cup she had been given to drink. My attention was drawn to her feet where I saw blood and the dead babies that were formerly in her cup now at her feet. It was as if she was forced to see what she had done. Her feet were now covered in blood and had dead babies on top of them. I do not think it a coincidence that I would have such a dream because of the violence that is plaguing America. I am posting a dream & vision from 2013 and 2014 respectively that has to do with this current dream. On,02/09/2013, as I was spending time with the Lord in my car driving, I saw a vision. In this vision a saw the American flag with blood on it. It had been torn to pieces, little pieces, and had been put in either a waste can or a pail. I could feel a sense of strong grief over this. This would be Civil War once again within our country. I had a dream/night vision 01/09/2014/ In the dream I saw a casket draped with the American Flag. The casket was sealed but I could see inside the casket. What I saw was the White House and Congress, essentially our government, inside the casket waiting to be buried. I don’t recall seeing anybody else, however, I did see a lone Marine with a bugle playing taps. What comes to mind here is that the casket was not yet buried like the funeral at a city called Nain which Jesus and His disciples encountered. In that scenario, Jesus stopped the funeral procession and raised the woman’s child from the dead. We need to pray for our country. I do not know if any of us grasp the dire straights that America is in. We need to pray for America. A quote from Abraham’s second inaugural speech comes to mind here. Fondly do we hope, fervently do we pray, that this mighty scourge of war may speedily pass away. Yet, if God wills that it continue until all the wealth piled by the bondsman’s two hundred and fifty years of unrequited toil shall be sunk, and until every drop of blood drawn with the lash shall be paid by another drawn with the sword, as was said three thousand years ago, so still it must be said “the judgments of the Lord are true and righteous altogether. As with any dream/vision that I post on this blog, please tak it to the Lord in prayer and see what He tells you. Yes, I remember reading these dreams. I confess, I have a lot of the Old Testament prophet inside me and, when I see people in the United States FIGHTING to have their right to kill babies in the womb, this holy anger rises up within me and all I think of is God’s violent wrath on the United States. I do realize that their are different levels of God’s wrath–it doesn’t have to be a Sodom and Gomorrah kind of wrath. I can also see a civil war come upon the United States. Yes, I heard about that law in Virginia just yesterday. They want to be able to kill the child after being born. All I see is God’s wrath on some of these states. John3:30-He must increase but I must decrease. Join in elevating Jesus!